So here’s a wee reader quiz. 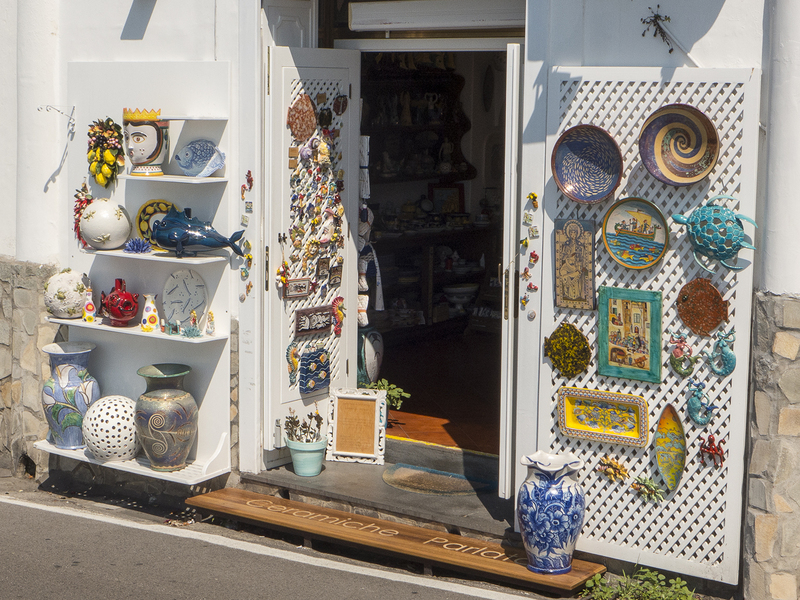 Which one of the selection of ceramic pieces displayed outside this Positano shop is currently on its way to New Zealand? As a clue, it’s one displayed outside to the left of the doorway as you look at the photo. Jean eyed this piece up when we were here last year but was put off by the price. Clearly it was so expensive it didn’t sell for an entire year – until we turned up again. If you are reading this post on Facebook, remember to click through to WordPress to make a comment or have a guess. This entry was posted in Amalfi Coast, Holiday, Italy, Positano and tagged Amalfi Coast, ceramic, Holiday, Italy, Positano, pottery, shop, summer by toscanakiwi. Bookmark the permalink. Is it the pretty yellow one below the green one? Not really qualified to comment on Jean’s tastes so can only say that if it had been my choice, the large one on the bottom white shelf, nearest the door.